The city was founded in 360 B.C. by Philip II of Macedon. From Neapolis Paul followed the Via Egnatia to Philippi. This road divided Philippi in half, running between the eastern Neapolis gate and the western Krenides gate. Paul may have entered the city through the former gate and left for Thessalonica through the latter. Philippi stretched into the Plain of Philippi, where, in 42 B.C., Antony and Octavian defeated Brutus and Cassius in the battle of Philippi. The battle was fought near the Gangites River, and in large measure determined the fate of the Roman Republic, which became the Roman Empire. Strabo called the battle a turning point for Philippi, which was afterwards greatly enlarged (Strabo, 7.fragment 41). Roman soldiers settled in Philippi under orders from Antony, whose legate13 set aside the territory of Philippi as a Roman colony. In 30 B.C., Octavian expelled from Italy many who had sided with Antony on a problem that arose after the battle of Philippi and allowed the veterans who supported him to settle in their place. Some of those forced to leave Italy settled in Philippi. In 27 B.C., Octavian made Philippi a Roman colony, naming it Colonia Julia Augusta Philippensis. This name was found on inscriptions discovered in the east temple and in the library. Philippi’s marketplace was decorated on both ends with fountains. On the northern end was a speaker’s platform (bema) with steps leading up to it on either side. Paul may have stood at this platform when he defended himself before the magistrates, just as he did in Corinth only a few weeks later (see Acts 16:19-21; 18:2). According to inscriptions, the present marketplace was built by Marcus Aurelius about A.D. 160. Nevertheless, the general layout is probably the same as it was in Paul’s day. In 1984, an inscription was found on the east side of the marketplace that contains a dedication to Nero Claudius Drusus, father of Claudius. 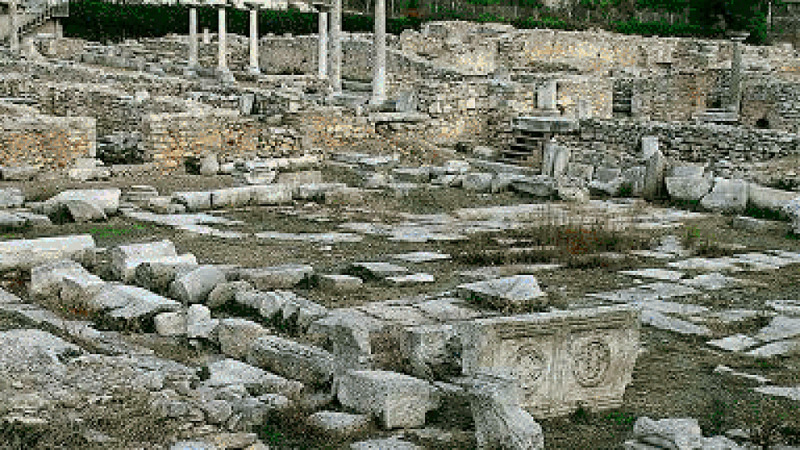 According to Luke, Paul visited Philippi during the reign of Claudius (Acts 18:2). In Philippi, Paul and Silas “went outside the gate to the riverside, where [they] supposed there was a place of prayer.” One of the women who heard them speak, “a seller of purple goods, who was a worshiper of God,” was converted and baptized “with her household.” The woman’s name was Lydia, and she was from Thyatira in Asia Minor (see Acts 16:12-15). The conversion of Lydia represented the establishment of the first Christian church in Europe. One of the possible sites for this event is the western Krenides gate, where the nearby Krenides stream flows. The gate has been dated to the time of Paul. Locals refer to the river as “the River of Lydia.” Another possibility for the site of Lydia’s conversion is the eastern Neapolis gate, where outside the gate there is a stream bed. Excavations near the gate have uncovered the foundations of two churches. One, dating to the 4th century A.D., was dedicated to Paul.16Philippi did not have a synagogue, and it is assumed that the Jewish community was small. The acropolis of Philippi rises above the marketplace a little to the north, overlooking the Philippian Plain where the battle of Philippi took place. The theater of Philippi is on the eastern side of the acropolis. It seated an estimated 5,000 people and “was certainly at its prime during Paul’s visit there” (Pfeiffer, p. 453). West of what archaeologists call Basilica Astands a small crypt, which a 5th century A.D. tradition holds was the prison where Paul and Silas were kept (see Acts 16:16-24). When Paul left Philippi, he left Luke behind to mind the flock and to continue the missionary effort. The word “we” disappears from the text, which is the word always used by Luke when he was accompanying Paul. Luke joined Paul again when he left Philippi on his third missionary journey and sailed for Troas (Acts 20:6). Acts 16:12-15. Paul and Silas came to Philippi on Paul’s second missionary journey. Lydia, “a seller of purple goods” from Thyatira (see p. 83), and her household were converted and baptized. Acts 16:16-24. Paul commanded an evil spirit to come out of a certain slave girl, “who had a spirit of divination.” He and Silas were brought before the magistrates, who beat and whipped them, and cast them into prison. Acts 16:25-34. Paul and Silas were miraculously delivered from prison. The jailer and his household were converted and baptized. Acts 16:35-40. Paul and Silas departed Philippi after declaring their Roman citizenship to the magistrates. Acts 20:2-6. Paul passed through Philippi at the close of his third missionary journey, on his return to Jerusalem. Philip. 1:7, 13-17. Paul wrote his epistle to the Philippians while imprisoned in Rome.